Observed at Wundanyi, Taita Hills, Kenya, 29 May 2017. One or more times per year ant colonies send off batches of winged reproductives, both females (potential queens) and males. 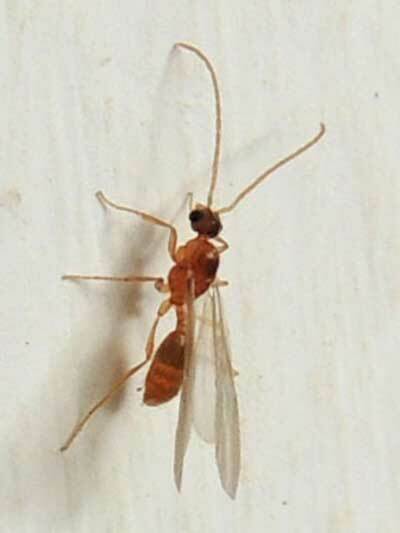 The wingless ants in the colony, except for the larger queen, are all sterile, non-reproductive females. It is only by the seasonal release of winged reproductives that the colony can reproduce and start new colonies. Mating typically occurs on the wing, possibly high in the sky, after which the male dies, the female casts off her wings and proceeds to initiate a new colony. Nearly all the potential queens become food for birds, reptiles and spiders and thus never succeed in starting a new colony. Only by shear numbers of reproductives emerging, often all at once, do some succeed. Copyright Michael J. Plagens. Page created 6 Sept 2017.